The craze, and the name, started in Britain and the bikes involved were generally home-grown machines: Triumphs, Nortons, BSA’s and the like. 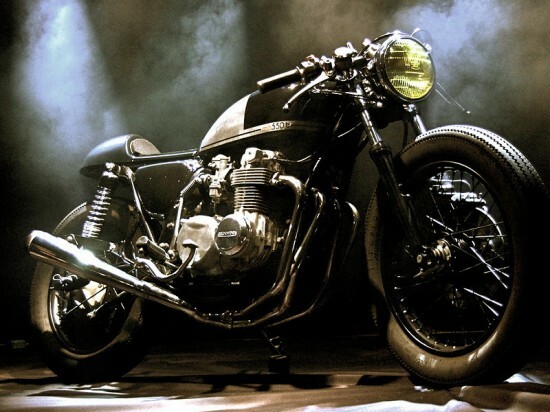 But in recent years, it’s become very popular to use the less expensive ands more reliable Japanese bikes of the 1970’s like the one shown here to recreate the look and feel of the café racer era, although nice examples of those machines have begun to increase in value, making them a less attractive proposition for heavy customization. Honda 750 and 550 four cylinder bikes seem by far the most popular candidates, and eBay has customs of various quality available from time-to-time. I bought this bike last year from the original owner. It starts on first kick and runs great. I had a complete tune up, new plugs, oil, timing and carb sync done. Electric start is not hooked up right now. The pictures are professional pictures and the bike has been garaged but I do want to mention that there is some surface rust on the inside front of the headers and on some of the bolts. The outdoor pictures were taken a couple days ago and you can see the surface rust on the headers. The mileage is about 30,000 but I had the original speedometer removed. 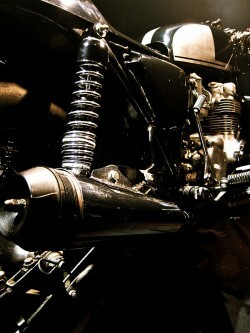 All work was done by the award winning cafe racer garage MotoHangar in Vienna, VA. 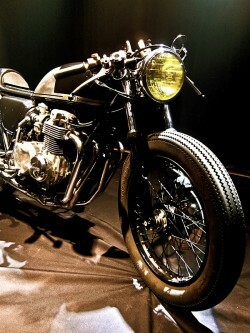 If you’re not familiar with Benji’s Café Racers, do yourself a favor and DO NOT visit his site: if you don’t already have a café-d out Honda, you’ll be planning to put one in your garage so you can buy some of his parts to hang on it. The bike being offered seems honest and very cool: simple and rewarding to work on and fun for a Sunday morning blast. I’ve got nowhere to keep a third bike, but I’d love to own a bike with this sort of look and sound. Right now, the price is at $3,500 with 0 bids so far. Depending on where the reserve is set, this might be an excellent way to get a very sharp ride in your garage for chump change. 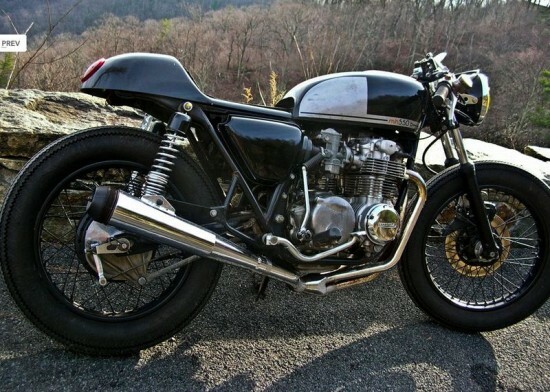 Is the 78 cb 550 still avail? Do you still have this? I’m very interested.